On July 31, 1790, the United States issued its first patent to one Samuel Hopkins for a process that improved the making of potash, a fertilizer ingredient. Now, the U.S. Patent and Trademark Office grants more than 300,000 patents per year. In the past 225 years, people have patented some pretty weird stuff. Here are 10 stand-out inventions. So rarely does a rodent owner get to bask in the public adoration of his or her pet as a dog owner might in the course of a walk around the neighborhood. One small pet lover tried to remedy this situation by inventing “pet display clothing,” which would allow a small animal to run around in tubes strapped around your body. “Outer wall portions of the passageways are transparent so that a pet moving along the passageways can be seen by a spectator,” according to the 1999 patent. “Graphics or indicia depicting the pet's habitat or a pet story are marked on the vest and extend across portions of the passageways masking delineations or depicting the passageways as burrows.” Intricate. There are plenty of people who have an irrational fear of being buried alive. Surely Christian H. Eisenbrandt, the inventor of a “life-preserving coffin” patented in 1893, had such a phobia. This easy-open coffin was rigged with a powerful spring that, when pushed from the inside by “any one who may not really have departed this life,” would blast the coffin lid open. He suggested that the coffin be placed in a vault with a key placed inside, so that whoever might wake up from a death-like slumber could get out. In the 1830s, an intrepid inventor with a reasonable fear of drowning whipped up a design for a truly important piece of wearable technology: a wearable lifeboat. In 1837, John Macintosh proposed a waterproof canvas sack filled with air that would keep a person afloat. 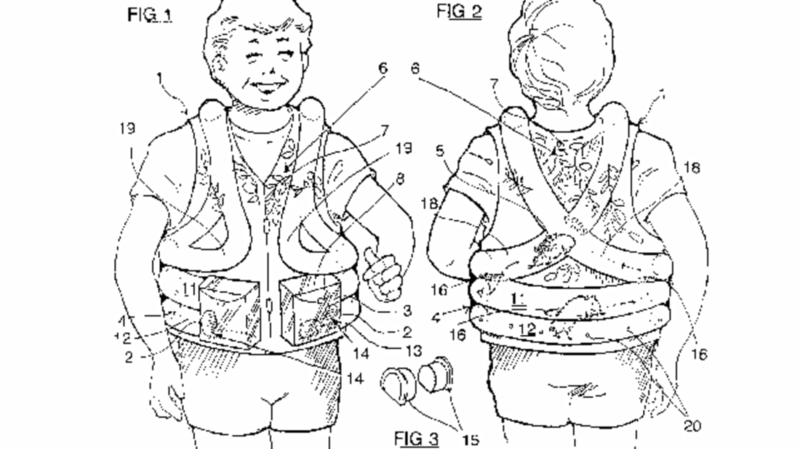 Kind of like a life jacket, but with room to bring snacks. With all due respect to people dealing with a plague of household mice, reenacting the French Revolution may not be the best way to get rid of your pest problem. But if you really want to decapitate rodents, the rodent company Woodstream patented a mini mouse guillotine in 2014. Rather than spaying or neutering your dog or cat, consider just putting them in a harness that will tamp their junk down. Yes, what your dog needs is a chastity belt. Some apartments are just too small for multiple appliances. The combined clothes and dish washer, patented all the way back in 1890, is a space-saving invention allowing you to clean your dishes and your dresses in the same place. Needless to say, there’s no spin cycle here. While this sounds like another invention from someone paranoid of coming back to consciousness in a coffin, the cell phone in this 2011 coffin design patent is actually designed to take incoming calls. If someone cannot make the funeral of a loved one, a working cell phone placed inside the coffin would help “family members easier come to grips with feeling of guilt owing to the event and call or ‘speak’ with the deceased.” Sadly, there are no pictures included. Sometimes you just don’t have the hands for an umbrella, but you want something a little more protective than a hat. Cue the umbrella hat. This 1941 patent wasn’t the first hat designed to shield people from the rain (that would be, um, most hats) but it did feature lengthy descriptions of how the mechanisms of opening an umbrella atop a head could be improved. Berlin-based inventor Martin Goetze created a terrifying drill-like device designed “either to produce dimples on the human body or to nurture and maintain dimples already existing.” His patent for a handheld crank to massage dimples into the skin was granted in 1896. However, he wasn’t the only inventor who saw the merit in such a device. Evangeline Gilbert filed multiple patents for a similar machine, one in 1921 and another in 1937.